Muckle-Wells Syndrome (MWS) is a form of CAPS that is caused by genetic mutations on the NLRP3 (CIAS1) gene that encodes the cryopyrin protein. MWS can be caused by a spontaneous mutation of the NLRP3 gene; but in most cases the genetic mutation has been passed along for generations in families. The NLRP3 mutation is autosomal dominant, which means that if one parent has the NLRP3 mutation and it is passed on genetically to the child, then the child will have CAPS. There is a 50% chance that a parent with CAPS will pass the NLRP3 gene mutation onto their child. The dominant NLRP3 mutation does not require two parents to have the mutation to pass the syndrome genetically to their offspring - only one person with the mutation can cause CAPS to be passed on the next generation. Most families with CAPS usually have FCAS or MWS, and affected members of the family often share common symptoms or severity. Sometimes there can be a variable level of expression of CAPS symptoms within large family groups with the NLRP3 gene mutation. Most people with MWS do not have the same degree of inflammatory damage to their bodies as seen in NOMID patients, and most people with MWS have been able to get married and have children. This has led to the syndrome being present in some families for many generations. However, the mutation can occur randomly during early cell divisions at conception as well, which leads to spontaneous cases of MWS. Chronic, recurrent, generally non-pruritic (not itchy) urticaria, which is usually present during early infancy-but occasionally starts in early childhood. This can be very debilitating, because the rash is often ever-present all over the body. 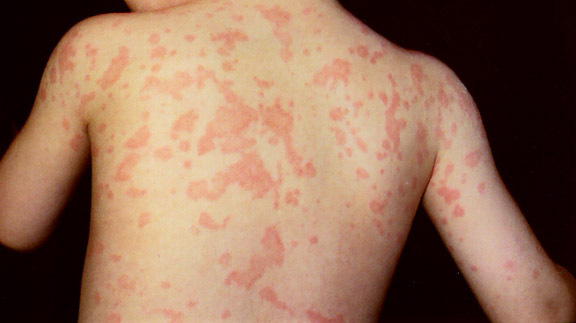 The rash looks similar to the rashes seen in NOMID and FCAS. Moderate, low-grade fevers are often present, and add to the frequent suffering. Fevers start in early infancy. The fever can be periodic, and is associated with flare-ups of CAPS symptoms, including: rashes, joint pain, headaches and eye inflammation. Symptoms of fever with the other symptoms usually last 1-2 days, and can be triggered at random, or sometimes by cold temperatures, stress or exercise. Cold temperatures generally trigger FCAS and MWS, but not all MWS flares are triggered by cold. Flares can be more unpredictable and variant, with no obvious triggers, sometimes occurring almost daily. There are often joint pains (arthralgias or arthritides), but generally NO tissue and cartilage changes can be seen on X rays. This is one characteristic that sets MWS apart from NOMID/CINCA, since bony changes, especially at the knees, can be seen in 50% NOMID patients, but are NOT commonly found in MWS or FCAS. Conjunctivitis (inflammation of the white part of the eye, but in this case, not from infection) in the eyes is a recurrent problem with MWS, especially during flare-ups of symptoms. Many MWS patients have also been found to have a haze on their corneas, which does not affect vision nearly as much as one would expect for the degree of haze. MWS generally does NOT cause the other eye changes seen in NOMID/CINCA, which can be serious, since CNS (brain and spinal cord fluid) pressure is NOT generally present in MWS. Sensorineural hearing loss occurs in most MWS patients during early adolescence, and can be very profound. It can often be improved with hearing aids. NOMID/CINCA patients often have sensorineural hearing loss, or progressive losses, but this begins in infancy or early childhood. 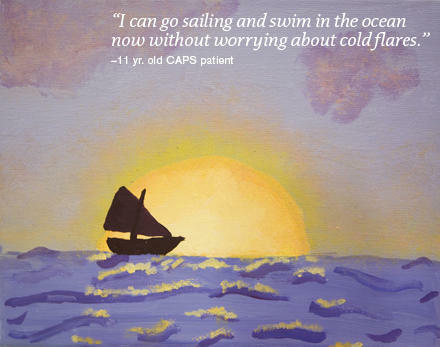 It is too soon to tell if early medication treatment for MWS or NOMID/CINCA will prevent or decrease the development of hearing loss, but there is great hope that it will make a significant difference. MWS can have severe consequences due to chronic high levels of inflammation in the body. This can be life-threatening if Generalized Amyloidosis of the AA type develops, due to long-term buildup of amyloid protein products from the chronic inflammation in MWS. Over 25% of MWS patients have elevated Serum Amyloid, and at least 25% have Amyloidosis. Serum AA testing is essential to follow, along with C-reactive protein (CRP), Erythrocyte Sedimentation Rate (ESR) and other lab tests. Amyloidosis is also a risk to some FCAS and NOMID/CINCA patients, but is not seen at the same level of frequency as in MWS. Generalized Amyloidosis is due to a permanent buildup of amyloid in the kidneys, liver and elsewhere, that can be fatal. Currently, the best treatments found to help the many of sufferers of MWS have been the use of various Interleukin-1ß blocking, trapping or otherwise attacking drugs to prevent the cellular uptake of Interleukin-1ß in CAPS patients. There are some medications that are FDA-approved and very effective for MWS. For more information, please go to the Treatments page.